The Cerro de Monserrate can be seen from anywhere in the city if it's not to foggy out. Since it's 3152 meters high, it's sometimes blocked out. You can get there by a cable car during the week which costs about 5 € round trip (before, you could walk up and down but now the road is closed), and Sunday it's only half-priced but there is a long queue. At the top, apart from the sanctuary, there is an crossroads, two upscale restaurants and lots of shops and popular restaurants, plus 2 viewpoints: one overlooking the city and another which is almost hidden and looks towards the surrounding mountains. 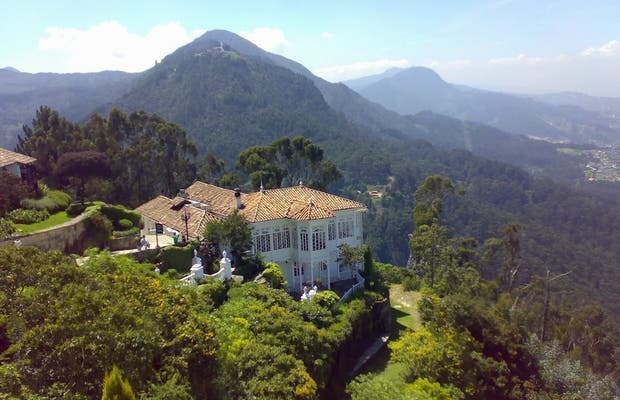 The Sanctuary of Monserrate is an awesome place. You can enjoy typical food and friendly people. This place has the best view of the city and isn't expensive. Please, you have to eat tamal and chocolate with almojabana. It's delicious! If you like, you can climb the mountain using the official road on Saturday early in the morning...it's a special experience and worth the effort! Tiene una excelente vista de la ciudad de Bogotá. Tiene dos vías de acceso que es difícil definir cuál tomar, ya que puedes llegar caminando por un sendero empiedrado, en el cual puedes ir obteniendo cada vez una mejor vista de la ciudad. Allí encontrarás una de las Iglesias más antiguas de Colombia y de América, finalmente una gastronomía muy típica colombiana. Was like a dream hehe there's an amazing view from there. Hmm..yeah why not. You have a really nice view of the city but it's really touristy. Love the view of the city.